Joseph of Arimathea appears in all four canonical Gospels, described with differing details (Sanhedrin member or not, open or covert follower of Jesus) but consistently as a man who donated his own prepared tomb for the burial of Jesus. In our visit to Glastonbury, we will encounter many references to him. The local legend is that Joseph of Arimathea visited Glastonbury. Various writers of the third and fourth centuries wrote that Christianity was known in Britain before the year 222, but none of them mentioned specific missionaries. Then the 9th century Life of Mary Magdalene was attributed to Rabanus Maurus (766-856), the Archbishop of Mainz. Rabanus (or his ghostwriter) described a sea voyage to Μασσαλία, or Massalia, today's Marseille. The entourage included Mary Magdalene, Mary and Martha from Bethany and their maid Marcella, Lazarus, Eutropius, Salome, Cleon, Saturnius, Maxium, Martial, and Trophimus. The group then split up, "each company going to the province where the Holy Spirit directed them." William of Malmesbury mentioned Joseph in 1125 in his Gesta Regum Anglorum or Chronicle of the Kings of England. He said that Philip the Apostle sent twelve Christians including Joseph of Arimathea to Britain, and they founded Glastonbury Abbey. Soon after William's book, in 1138, Geoffrey of Monmouth continued the "speculative history" trend in his Historia Regum Britanniae or History of the Kings of Britain, bringing King Arthur into the mix. Chrétien de Troyes then wrote a number of Arthurian romances, including Perceval le Gallois in which the Holy Grail first appears. The Grail can be a dish, a plate, a cup or even a stone. Wolfram von Eschenbach later described it as a meteorite. In Perceval le Gallois the Grail is a serving dish used at a feast, wondrous but not specifically "holy". Robert de Boron wrote the first explicitly Christian version of the Grail story. In his late 12th century Joseph d'Armathie the Grail was the cup Jesus used at the Last Supper. Joseph of Arimathea later received the Grail from an apparition of Jesus. He was put into prison, where the Grail sustained him. He was released, organized a group of followers, and led them to Britain with the Grail. They delivered the Grail to the vaus d'Avaron, the valleys of Avaron in the west, which later changed slightly to Avalon. Robert de Boron was mostly just extrapolating from stories contained in the apocryphal Πράξεις Πιλάτου or the Acts of Pilate. It purports to be an official report by Pontius Pilate to Claudius, but is now viewed as a Christian invention of the mid fourth century intended to rebut anti-Christian writings. 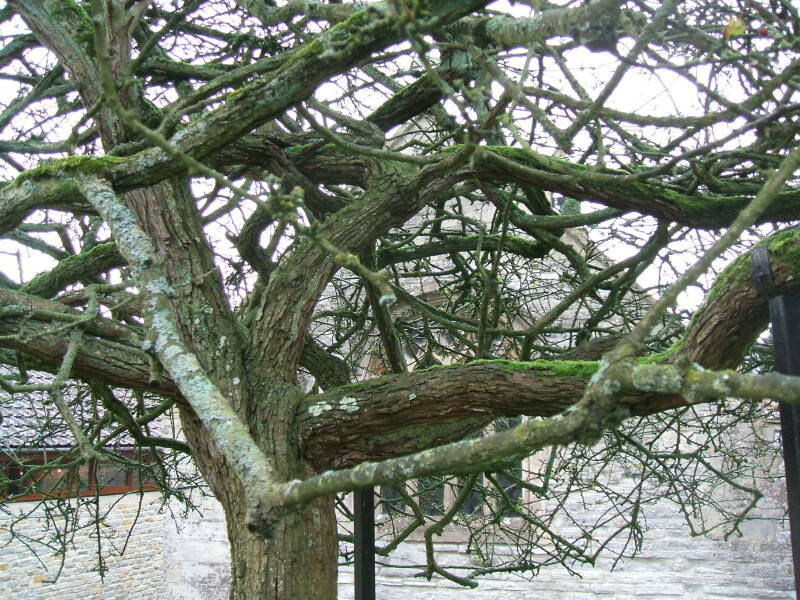 The story grew to include the detail that when Joseph of Arimathea arrived at Glastonbury, he thrust his staff into the ground and it immediately blossomed, took root and grew into the original Glastonbury Thorn tree. The Glastonbury Thorn piece of the legend first appeared in the early 16th century Lyfe of Joseph of Arimathea. The Glastonbury Thorn is a form of the Common Hawthorn tree. The strain found in the Glastonbury area is unusual as it blossoms twice a year, in winter and again in spring. There are debates about which is "more original" than the others — the tradition had Joseph planting his staff on Wearyall Hill, but this example is on the Abbey grounds. The dual blossoming strain is propagated by grafting. The one perceived as "most original" in the mid 1600s was destroyed by Oliver Cromwell's forces as a superstitious relic. That didn't stop local promotion of the remaining inventory of holy thorn trees. Blossoming in winter and again in spring was of course interpreted and reported to mean precisely on Christmas morning and Easter morning. That led to increased interest in late 1752 when the Gregorian calendar had just been adopted in England, dropping twelve days in September. Would the tree blossom on Christmas day by the "new style" Gregorian calendar, or on Christmas as defined by the "old style" Julian calendar, which now was January 5th? Writers were repeating and expanding the legends of Joseph of Arimathea and the Holy Grail. John of Glastonbury wrote a history of the Abbey in 1350. He added the details that Joseph brought a wooden cup used at the Last Supper, and he also brought two cruets. One contained the Blood of Christ, the other the Sweat of Christ. Joseph had collected these during the crucifixion. John's 1350 "history" also included the news that King Arthur was a descendant of Joseph of Arimathea. Sir Thomas Malory compiled Le Morte d'Arthur as a collection of all the Arthurian legends available at Malory's time plus a few pieces he added. Malory's Le Morte d'Arthur was published in 1485 as one of the earliest printed books in England. Its breadth and popularity have made it the standard version of the legends, most Arthurian writings since have been based on it. But people lost interest in King Arthur toward the end of the Middle Ages. Le Morte d'Arthur was printed one last time in 1634, but it was almost 200 years before it was printed again. Interest in King Arthur returned in the early 19th century. Le Morte d'Arthur returned to print in 1816. Tennyson's Idylls of the King appeared in 1859, it retold the story of Arthur for the Victorian era. Renewed interest in King Arthur meant renewed interest in Joseph of Arimathea. Sabine Baring-Gould's explained in A Book of Cornwall in 1899 that Joseph's wealth alluded to in the Gospels came from his work as a tin merchant, and he traveled regularly between the eastern Mediterranean and the tin mines of Cornwall, the tapering peninsula running south-west beyond Somerset. Back in medieval times it had already been worked out that Joseph of Arimathea was the uncle of Mary (or possibly the uncle of her husband Joseph). Well, if Jesus' great-uncle was traveling to and from Britain all the time, then obviously he must had taken the boy along on at least one trip, right? And if this boy learning carpentry was in Glastonbury, then obviously he must have helped to build something there, right? 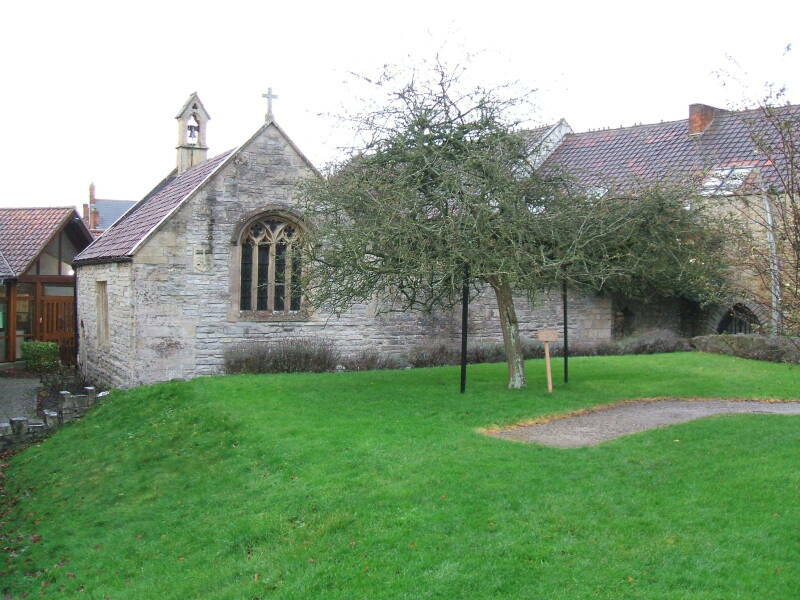 So the "original Christian church" in Glastonbury was built by none other than Jesus himself. Or so the theory goes. Walk upon Englands mountains green? This self-fulfilling circular reasoning had already led to William Blake's poem "And did those feet in ancient time", written in 1804. On Dartmoor the stream tin can thus be run out of the ore with a peat fire. And the Dartmoor stream tin has this merit: it is absolutely pure, whereas tin elsewhere is mingled with wolfram, that makes it brittle as glass; and to separate wolfram from tin requires a second roasting and is a delicate process. Another Cornish story is to the effect that Joseph of Arimathea came in a boat to Cornwall, and brought the Child Jesus with him, and the latter taught him how to extract the tin and purge it of its wolfram. This story possibly grew out of the fact that the Jews under the Angevin kings farmed the tin of Cornwall. When tin is flashed, then the tinner shouts, "Joseph was in the tin trade," which is probably a corruption of "Saint Joseph to the tinner's aid!" Dugdale's Monasticon Anglicanum has an account based on the fanciful 1350 history by John of Glastonbury. About sixty-three years after the Incarnation of our Lord, St Joseph of Arimathea, accompanied by eleven other disciples of St Philip, was despatched by that Apostle into Britain, to introduce in that place of barbarous and bloody rites, long exercised by the bigotted and besotted druids, the meek and gentle system of Christianity. They succeeded in obtaining from Arviragus, the British king, permission to settle in a small island, then rude and uncultivated, and to each of the twelve was assigned for his subsistence, a certain portion of land called a hide, comprising a district, denominated to this day THE TWELVE HIDES OF GLASTON. Their boundaries, as well as the names of the principal places contained in them, will be found in the Appendix (nos. i. and ii.). They enjoyed all the immunities of regal dignity, from ancient times and the first establishment of Christianity in this land. One peculiar privilege which this church possessed by the grant of King Canute (App. num. lxvi. ), was that no subject could enter this district without the permission of the abbot and convent. It now includes the following parishes; Glastonbury St Benedict, Glastonbury St John, Baltonsbury, Bradley, Mere, West-Pennard, and North-Wotton. The name by which the island was distinguished by the Britons was Ynswytryn, or the Glassy Island, from the color of the stream which surrounded it. Afterwards it obtained the name of Avallon, either from Aval, an apple, in which fruit it abounded; or from Avallon, a British chief, to whom it formerly belonged. The Saxons finally called it Glæsting-byrig. Here St Joseph, who is considered by the monkish historians as the first abbot, erected, to the honour of the Virgin Mary, of wreathed twigs, the first Christian oratory in England. See Joseph of Arimathie: Otherwise Called The Romance of the Seint Graal, Or Holy Grail for scholarly analysis of one version from 1350 and some from the early 1500s. It came to be believed that Joseph was buried in the chancel of the church which had replaced his mud-and-wattle hut. In 1345 John Blome of London dreamed that he had been divinely instructed to search Glastonbury for Joseph's grave. Edward III sanctioned the project on June 10th of 1345, and Blome went to Glastonbury to start digging. It took surprisingly long, given how quickly the monks had found Arthur and Guinevere. But in 1367 the chronicler R. de Boston reports that the tomb and remains of Saint Joseph of Arimathea had been found. 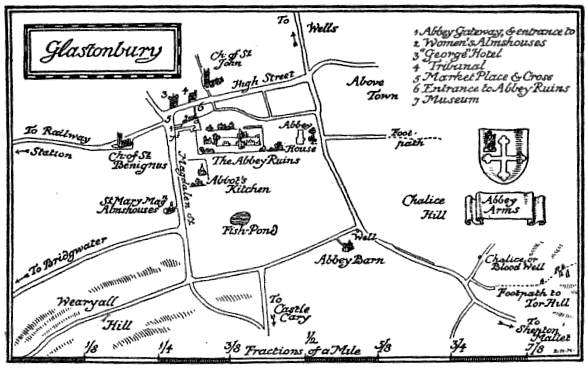 Map of Glastonbury showing the Abbey, Wearyall Hill, the Chalice Well and the Tor, from Wells and Glastonbury, a Historical and Topographical Account of the Cities. The monks immediately began to take advantage of the discovery, preparing a shrine for his remains in the Lady Chapel. It became a popular place of pilgrimage and the reports of miracles began, perhaps inevitably, to appear with remarkable frequency. Remember that the monastery was suppressed in 1539 and this abruptly ended the pilgrimages and miracles. There is a report from 1662 that a traveler saw Joseph's tomb, but that was the last such report. Now let's visit where Joseph of Arimathea supposedly first arrived.